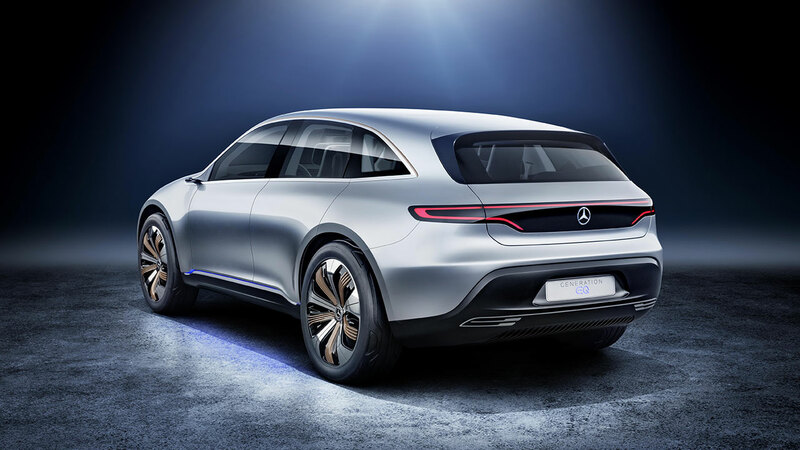 With "Generation EQ", Mercedes-Benz shows how electric cars can soon move into the fast lane: the concept vehicle, with the appearance of a sporty SUV coupé, gives a preview of a new generation of vehicles with battery-electric drives. The dynamic exterior design with its new electro-look underlines the focus on the powerful electric drive system: two electric motors, with a system output that can be increased to up to 300 kW thanks to scalable battery components, and permanent all-wheel drive deliver the guarantee of dynamic high-level performance. 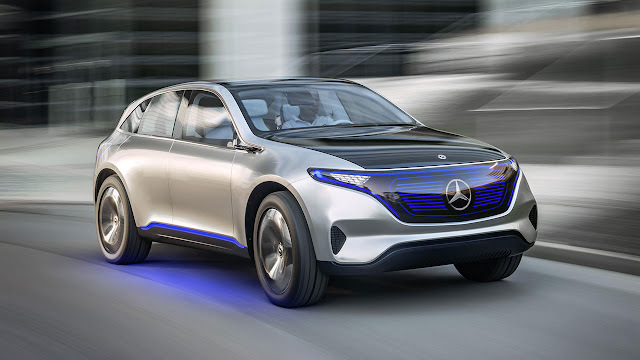 With a range of up to 500 kilometres and the typical Mercedes strengths of safety, comfort, functionality and connectivity, "Generation EQ" meets every demand in terms of contemporary, sustainable mobility. 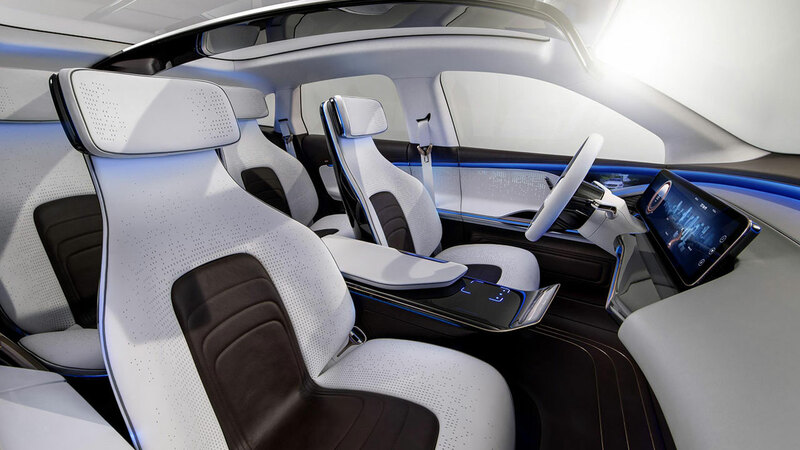 Also on the inside, the vehicle offers innovative solutions, including a completely new interior concept. 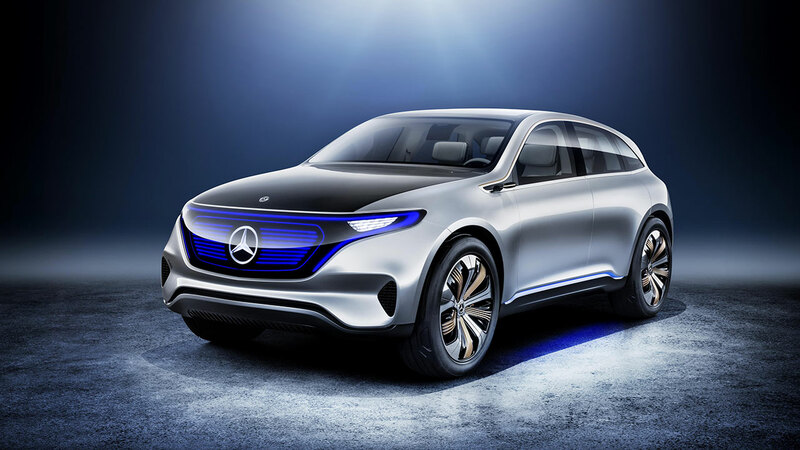 Celebrating its world premiere at the Paris Motor Show, "Generation EQ" is the forerunner of Mercedes-Benz's new product brand for electric mobility, EQ. The name EQ stands for "Electric Intelligence" and is derived from the Mercedes-Benz brand values of "Emotion and Intelligence". Similar to the latest series-produced models from Mercedes-Benz, the vehicle architecture builds on an intelligent multi-material mix of steel, aluminium and carbon fibre. This ensures that the requirements in terms of lightweight design, strength and cost efficiency are ideally met. The monolithic basic form of "Generation EQ" unites the genes of an SUV with the dynamic character of a coupé and a dash of shooting brake at the rear end. The squat, elongated greenhouse gives rise to muscular-purist proportions. The new electro-look is the result of a flowing transition from the gleaming black bonnet across the windscreen to the dark-tinted panoramic roof - an exciting contrast to the alubeam silver paintwork. The information density can be increased step-by-step from a digital display and built up into a single- or dual-tube instrument containing more detailed information and feedback on speed and range. These modular displays allow the content to be individualised. An attractive user interface design is ensured by, among other things, a world of colours in electric blue, white and rose gold - the colours of the instrument displays adapt, depending on driving mode or charging process, to allow fast and intuitive recognition. It goes without saying that "Generation EQ" also features the latest driver assistance systems from Mercedes-Benz. Using highly accurate maps from our partner HERE, the systems know such things as the precise curve radii as well as the position and size of a roundabout. The vehicle can then automatically adjust the speed and driving dynamics to give the driver even greater comfort and relaxation. EQ thus takes a further step on the road to autonomous driving, always under the premise of safety and in compliance with the statutory regulations. There is a special focus on the optimised interplay between the individual features, so-called "sensor fusion", i.e. the intelligent combination of data from different sensors. 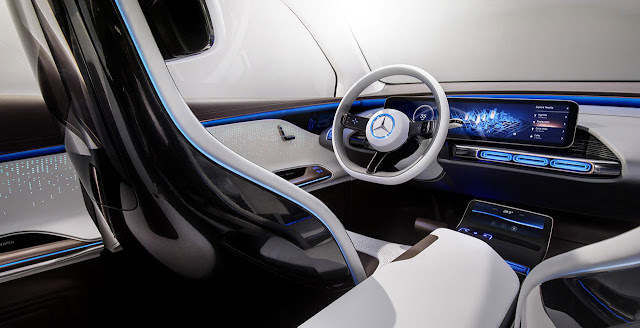 In the opinion of experts at Mercedes-Benz, this is one of the key requirements on the way to automated driving. But the engineers have gone one step further: for example, "Generation EQ" is equipped with Car-to-X technology and can exchange information with the infrastructure and other vehicles - an ideal basis for a series of new driver assistance features that build on existing systems and thus take a further step in the direction of accident prevention. It is also helpful for the driver to be informed about nearby recharging opportunities. As soon as "Generation EQ" realises that the destination cannot be reached on the available battery charge, it advises the driver of appropriate options on the navigation map. Additional driver incentives are conceivable: the wide-screen display can be used to tell the driver that the current range is not just sufficient to reach the desired destination, but would also allow a detour for a spur-of-the-moment visit to friends. In addition, the driver can collect bonus kilometres as a reward for especially efficient use of the traction battery - a functionality similar to the one already familiar from current models. The trick is that the collected bonus kilometres make the occupants aware of the attractions or interesting places they can reach from the current location thanks to their driving style.